This book and fifty-card deck are inspired by the ancient Lakota sweat lodge ceremony. Through the timeless medium of divinatory symbols, powerful images rekindle the spirit of this ancient ceremony. A variety of card spreads directs our consciousness toward the sources of personal power, insight, and self-awakening. This book and beautifully illustrated deck draw on the ancient Lakota ritual of healing and purification known as the sacred Inipi, or sweat lodge ceremony, which has existed in the Lakota culture for thousands of years. The cards and accompanying book comprise a self-contained and highly original system that will help you harness creative energies to deal with issues that are of concern in your life. 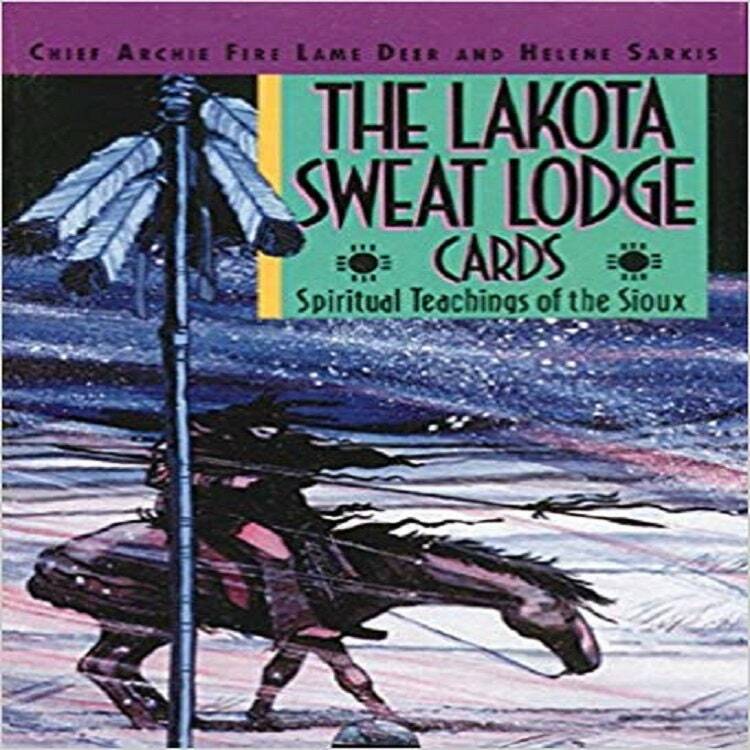 Used for self-discovery rather than divination, the cards gently guide you toward inner growth and self-knowledge in the time-honored tradition of the Lakota people. Fifty cards, illustrated in vibrant color, access the powerful symbols and teachings of the Inipi, capturing the spirit of this ancient ceremony. In a variety of spreads the authors show you how the cards can provide you with an expanded vision of your being and purpose, offering an intimate sense of walking in balance between the conscious world and the world of spirit. Publication coincides with the U.N. Year of Indigenous People. Archie Fire Lame Deer is one of the leaders of the Native American spirituality movement. A Lakota Sioux holy man and the son of medicine man John Fire Lame Deer, Archie Fire Lame Deer is the author, with Richard Erdoes, of Gift of Power: The Life and Teachings of a Lakota Medicine Man. Helene Sarkis is a designer currently working on numerous Native American projects, several of them with Archie Fire Lame Deer. Archie Fire Lame Deer is a full-blooded Sioux, a medicine man and the son and grandson of medicine men. A lecturer on Sioux religion and culture, he travels around the world teaching the ways of Native American spirituality, often by performing healing ceremonies. He has been instrumental in bringing Native religion into jails and in reforming laws so that medicine men can go into prisons to conduct ceremonies. He has also been very active in recovery programs for Native Americans who are alcoholics. Archie has joined the ranks of other spiritual leaders, such as the Dalai Lama, in the quest for world peace, while always remaining a traditional Sioux medicine man. He is the kuwa kiyapi, or intercessor, for the yearly Lakota Sundance and is the official representative for the Sacred Buffalo Calf Pipe at Crow Dog Sundance. After many years of adventure and travel, Archie has returned to his native South Dakota to make his permanent home among the Sioux people with his wife, Sandy, and their three children, John, Josephine, and Sarah. He is bringing up John to be his successor as healer and teacher; already he runs sweats and has "pierced" in the Sundance. Thus, generations of Lame Deers have followed, and will continue to follow, the way of the Lakotas. Beautiful book,I love it. Great condition,good price,quick delivery. Fantastic! Arrived quickly in excellent condition, wonderful communication, great experience, will buy from again. Thank you so much!